Warm cheesy bread is my weakness so by adding protein it becomes healthier and I feel less guilty when enjoying a slice. My family loves when I make my green chile cheese bread for Christmas. It is a holiday tradition for them. I tend to only make this bread for Christmas because it is a time-consuming bread to make and I tend to eat one too many slices of this gooey spicy bread. So I decided to make this delicious bread a bit healthier and easier to make so I could enjoy it year-round. 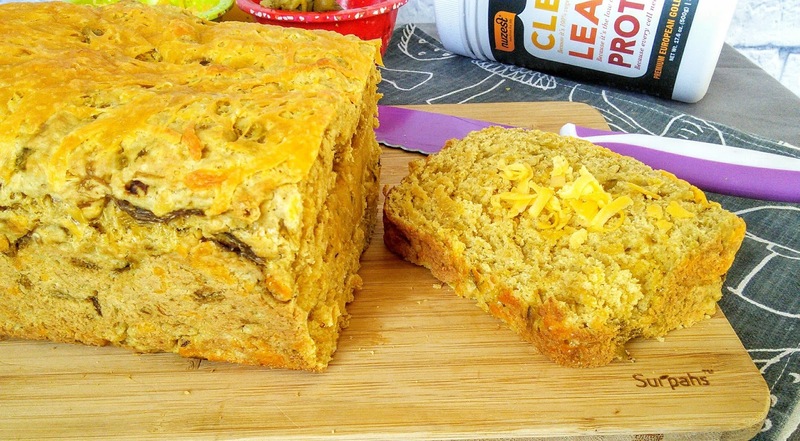 My original recipe is a yeast-based bread so I decided to make the healthier version a quick bread. I also added protein powder and wheat flour for nutrition. Now that this delicious bread is loaded with protein, I can enjoy a slice as part of a healthy meal. 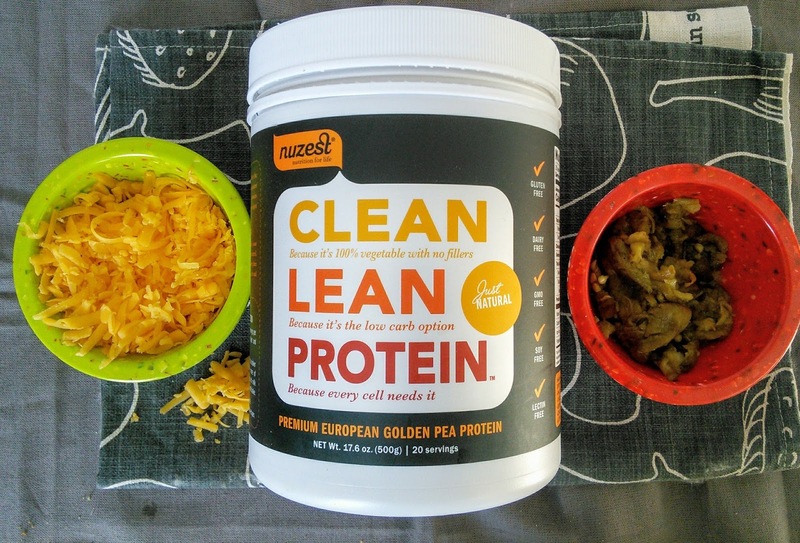 The best part is my family loved the bread and did not even notice the difference with the added protein powder and wheat flour. Did you know green chile is loaded with vitamin C? Green chile not only has plenty of vitamin C in it but it is also a great source of fiber. 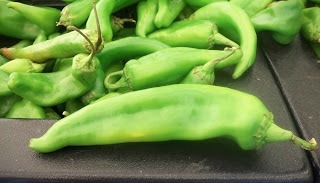 Most green chile (the good stuff) is grown in New Mexico and we New Mexicans love our green chile. We eat it almost anything. Green chile season comes once a year and most people here like to buy it buy it in large quantities ( 30 pounds or more) so they can enjoy it year-round. I always have plenty of green chile in my freezer. If you don't have green chile in your freezer, canned green chile will work just fine in this recipe. Green chile comes in mild, medium, hot, and extra hot. I recommend using mild green chile for a gentle delicious spicy flavor. If you like spicy/hot food, then use a medium to hot green chile. Lightly grease a loaf pan. In a bowl, combine the flour, protein powder, baking soda, baking powder, and salt. Then add the eggs, milk, and green chile to the flour mixture and combine well. Add the 1 1/2 cup shredded cheese and mix well. The batter will be like thick like a biscuit dough. Pour batter into the prepared pan and sprinkle the 1/4 cheese on top. Bake for 50 minutes or until an inserted knife comes out clean. Cool the bread for 10 minutes before taking the bread out of the pan. * You can also make delicious drop biscuits with dough. Just drop the batter by large spoonfuls on a greased baking sheet and bake for 20-25 minutes or until the biscuits are slightly brown and set. These cake looks so so good! I love when cheese is involved. I don't do much exercise so i am not i'd need to add the protein. BUt i could defo try this recipe! This looks so good and I love the healthier version. I will be checking out the Protein powder. Green chile cheesy bread...nom nom nom! It looks yummy! I looove green chilies. They really work in so many different recipes, as you easily proved right here. Looks delish! I LOVE this type of bread. 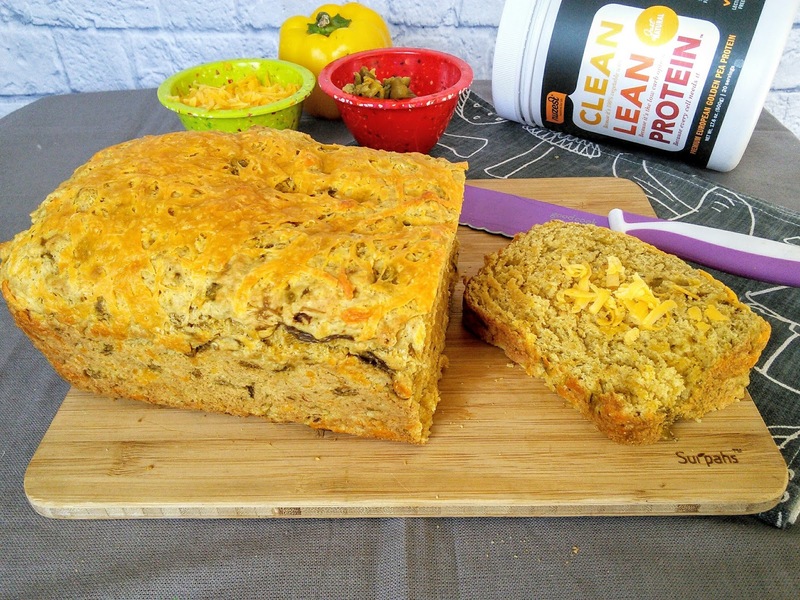 I've never thought about putting protein powder in bread — good idea! I live in New Mexico and am completely obsessed with green chile. 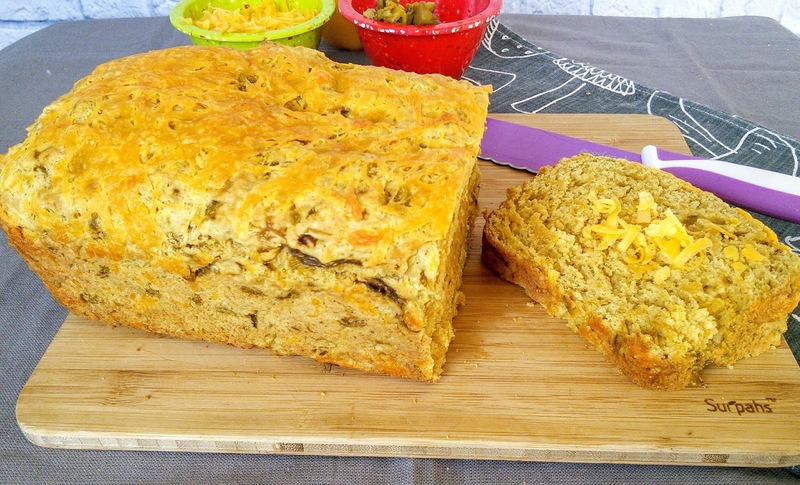 I have never tried making green chile bread though - so I am definitely trying this! It looks delish! I want to try this one out. It looks very good and filling! This will fit right into the diet! Thanks for sharing this one! Well this is a totally new one! I want to know where you cam up with this it looks amazing! Bread and chiles?! Two of my favorite things ever. I need to try this recipe! This sounds really good would love to try and make your recipe. Great for diets. This looks and sounds good. I want to try this soon. Yum!